I hope that you all can listen to it. Thanks Chris. Nice words from such a connoisseur of the avatarian arts. I found the interview informative and inspiring. In the short time I've been playing shakuhachi I have made sure to practice every day - after hearing Ronnie's quote that "With shakuhachi, if you miss a day you go back a week", I'll be even more determined to find the time! Although I am unlikely to ever be able to commit 4 - 6 hours per day to practice the way he did as a student. 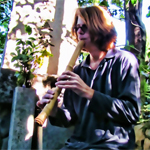 Having Ronnie teaching shakuhachi in Rochester is a great blessing for which I am very thankful. I enjoyed listening to the interview too. I appreciate how you were a pioneer of distance learning for shakuhachi, Ronnie. Thank you Erin, Andy, Rick, and Gianni! It seems that there were a surprising number of "hits" to the radio shows blog, and so they are doing another Interview live, with me, on Friday, April 15th, also at 3:00PM. Hey that's great Ronnie. I look forward to the next interview. That's great! I look forward to the next installment.